Primary spinal cord tumors are rare and account for 2–4% of all adult central nervous system tumors. Astrocytomas comprise approximately 6–8% of all spinal cord tumors. Tumor histology and grade are the most significant prognostic factors of primary spinal cord astrocytomas affecting overall survival. MRI is the primary imaging modality used to diagnose intramedullary spinal tumors. Achieving a good resection can be very difficult in spinal astrocytomas due to the involvement of the spinal cord itself. However, maximal safe surgical resection or biopsy is beneficial in diagnosing the patient and potentially providing symptom relief and improved outcomes. 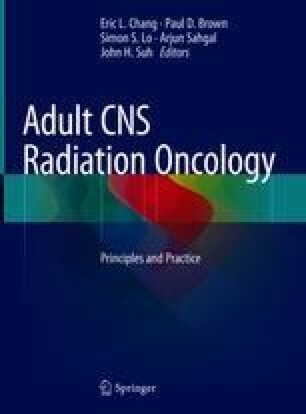 Adjuvant radiation therapy is a useful yet controversial treatment modality in the treatment of spinal astrocytomas given the low rates of gross total resection. It is generally accepted to treat high-grade spinal astrocytomas with postoperative radiation therapy as well as in cases of subtotally resected grade II spinal astrocytomas. Whereas, resected spinal pilocytic astrocytomas and gross totally resected grade II spinal astrocytomas may be observed. The role and benefit of chemotherapy require additional studies; however, extracting from intracranial data, temozolomide and bevacizumab are commonly used, particularly in high-grade tumors.